Kamaru Usman is getting a world title shot against Tyron Woodley on March 2 in Las Vegas. The event, which is slated for the co-main of UFC 235 (Tickets), goes down at the iconic T-Mobile Arena. Usman dominated this fight from start to finish, ultimately ending Hassan's night early with an arm-triangle choke in the second round of action. This outing, which earned Usman a nice "Performance of the Night" bonus check, put the newcomer on the map. The victory made him the "TUF 21" welterweight tournament winner, earning him a UFC mega-deal. Usman's performance in this fight was so impressive that it caused Dana White to give him an immediate title opportunity. Originally, the plan was to give former interim champ Colby Covington the next crack at Woodley's belt. But Usman's pure decimation of the tough, durable Dos Anjos was enough to convince White that he should jump to the very top of the ladder. While this fight was a short one, it makes the list because of how vicious the finish was. At the 2:48-mark of the first round, Usman knocked Moraes out cold with a thunderous strike. The professional way that Usman handled Maia -- a former UFC title challenger -- was certainly a surprise. Most thought that Maia would walk right through the "Nigerian Nightmare," but the fight definitely played out differently than expected. It was an utterly dominant performance from Usman, with five gritty rounds of world-class striking and high-level grappling. Usman took him to a unanimous decision on the judges' scorecards. In his final tune-up fight before getting called up to the UFC, Usman took on Hicks in a meeting under the Legacy banner. With a massive finish via TKO prior to the third round, it was clear this man deserved to move up to the bright lights of the Octagon. 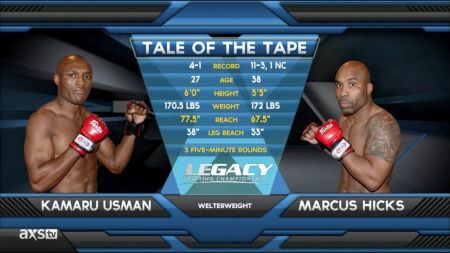 Usman went an undefeated 3-0 in Legacy, and his TKO of Hicks was perhaps the top highlight of his short tenure with the promotion.